A fireplace can add warmth and ambiance to your home. Whether you have the fireplace in the bedroom, living room, or other part of the house, they make the space feel cozy and inviting. If you have a fireplace that can work with a remote, you can have the ease of changing the settings on your fireplace without having to get up from the comfort of the sofa or bed. A remote control for your fireplace can allow you to program the thermostat so that it never goes cooler than your desired temperature. This can also help to save energy and save money on fuel costs. A remote control for your fireplace makes the unit easier and more convenient to use. Programmable fireplaces can heat to a certain temperature and turn off once that temperature is reached. You can control these settings with a quality fireplace remote control. Before purchasing a remote for your fireplace, be sure that it is compatible. The following is a list of the top 10 fireplace remote controls. 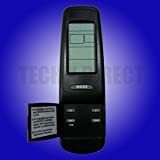 The Skytech programmable remote control has an LCD display that allows you to easily monitor your settings and change them for comfort. 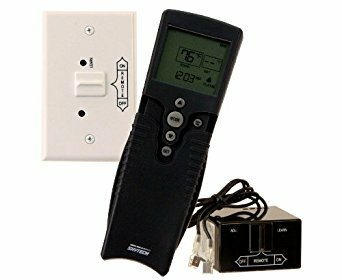 This remote can change the temperature and also set the timer as needed. It has a 24 hour clock and a 9 hour countdown timer. 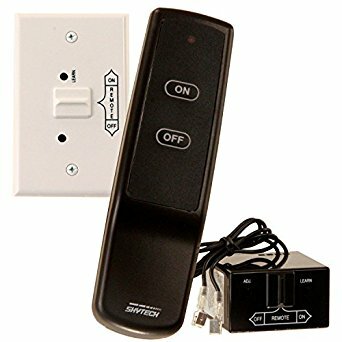 This remote control from Skytech gives you the option of controlling the receiver in the wall, on the hearth, or under the fireplace. It comes with the receiver, transmitter, wall holder, wall plate, batteries and instructions for installation. The Acumen fireplace remote control has an LCD screen that displays current temperature and allows you to change the temperature and heat settings. This remote control operates on 3 AAA batteries and the receiver takes 4 AA batteries. 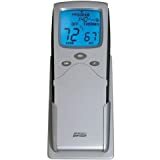 This remote is easy to use and has a thermostat so that you can always have a comfortable temperature in your home. 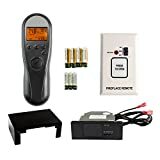 This fireplace remote comes with the receiver box, heat shield, wires with connectors, batteries and instructions for use. 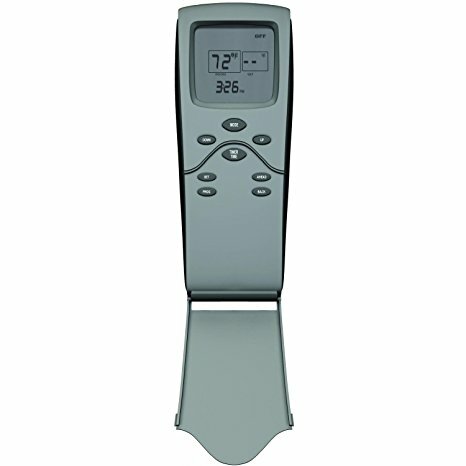 The remote features an on/off switch, a clock, a timer, and controls for the temperature. This remote is also easy to install. This remote control from Skytech comes with a flip cover that closes when not in use. This cover helps to protect the buttons. It has a 9 hour countdown timer that allows you to set the fire for the time you need it. This unit has a 24 hour clock. Both the transmitter and the remote are battery operated. This remote was created to be safe and user friendly. It is compatible with many different gas heating systems. 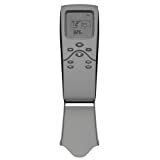 The remote can be used for controlling the temperature or setting the time. The system can also be used with the thermostat to keep the temperature at a constant comfortable level. This remote control from Skytech comes with the controller, receiver, wall holder, wall plate, batteries and instructions for installation. It has a flip cover that protects the buttons when not in use. 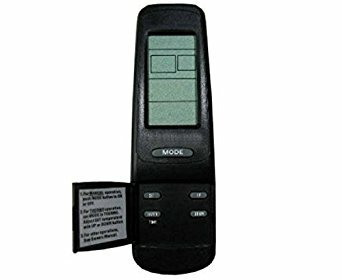 This fireplace remote control has 5 buttons to control the temperature and program the fireplace for comfortable settings. The Skytech remote control comes with a receiver that can be installed in the wall, on the hearth, or under the fireplace behind the control panel. The remote has a backlit LCD display that allows you to easily monitor and change your fireplace settings as needed. 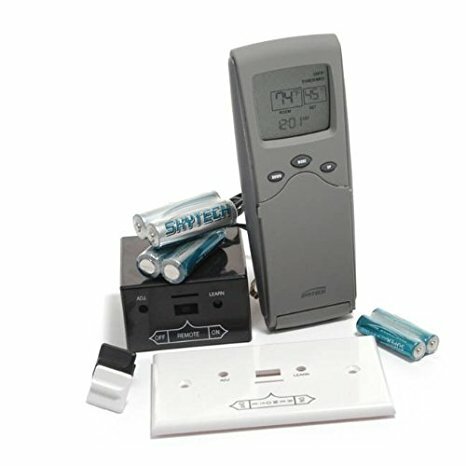 The Skytech SKY-3002 remote control comes equipped with a timer and thermostat. 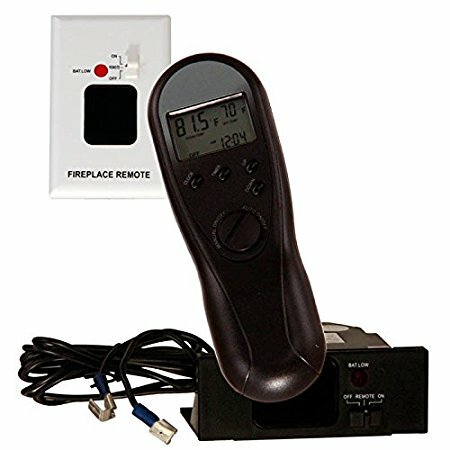 This remote has buttons that are easy to use to ensure that your fireplace is always set at a comfortable temperature. This system has a battery powered R.F. transmitter and receiver that provide a way to wirelessly control your gas fireplace. This remote control from Skytech has a receiver with a learn function that makes it user friendly. The transmitter uses 2 AAA batteries. The receiver uses 4 AA batteries. This system has a sensitive thermostat that activates even when the temperature fluctuates just one degree. This fireplace remote control from Skytech has a thermostat features that kicks the unit on even when the temperature drops just 1 degree. This system has a receiver that uses 4 AA batteries and a transmitter that uses 2 AAA batteries. It is compatible with many different types of gas fireplaces and is easy to install. The Skytech fireplace remote control comes with a receiver box, wall plate, wall clip, batteries and wires with connectors. 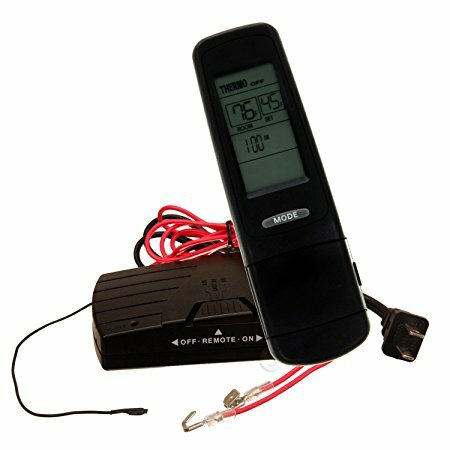 The transmitter has a learn function that makes is easy to use and to keep your temperature where you want it. The unit has a display that allows you to monitor your settings and change them as needed. The Ambient RC-RC remote receiver comes with the wire harness needed for installation. 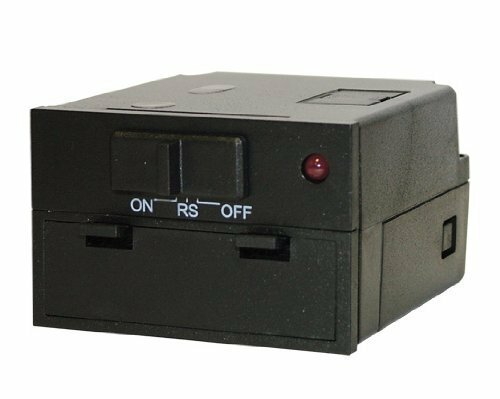 This receiver is compatible with several different remote transmitters. It is easy to install and works well to replace old receivers that are worn out. It comes with the batteries needed for use. The remote receiver from Ambient can replace many different receivers and the new wire harness is designed to replace older existing wiring harnesses. It comes with a white face plate kit, a black face plate kit, and two prong wires. This receiver is compatible with most 7 and 8 dip switch remotes. This simple remote control from Skytech is budget friendly and easy to install. It has a convenient on and off switch to control your gas logs. This remote is compatible with vented or vent free log systems. The entire system works on batteries so that you can use it during a power outage. 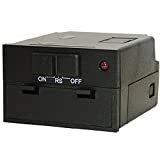 The Skytech remote control comes with a snap-on wall plate and all the wires needed for connection and installation of the receiver. The receiver can learn up to two additional transmitters so that you can use up to 3 remotes to control your fireplace. 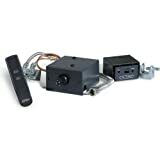 This system makes lighting your gas fireplace easy and quick from anywhere in the room. This remote control system from Skytech comes with a millivolt safety pilot kit and flame modulating remote. It is designed for use with 18 to 30 inch gas log systems. It has a 225 degree rated valve with an exclusive safety seal inside the gas valve. This system is designed for use with natural gas fireplaces and logs. 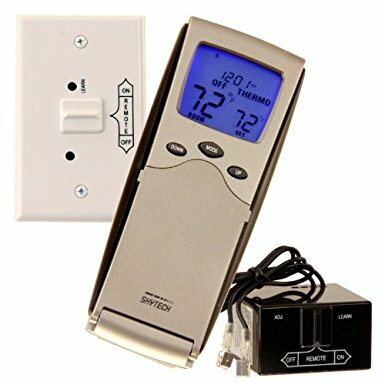 This system has a manual on/off gas valve and a flame modulation remote control that allows you to change the fireplace settings from anywhere in the room. It comes with the quick mount pilot assembly, damper clamp, valve, solenoid, flex line, and remote. The Skytech fireplace remote control provides a safe and reliable system for controlling your gas log fireplace. This system was designed to be easy to use. It can be operated using the thermostat settings or controlled manually with the included remote transmitter. It works on frequencies within 20 feet of the fireplace unit. This remote control from Skytech comes with batteries for use. It also has the wall mount plate needed for installation. The remote and receiver are programmed at the factory for compatibility which allows you to fell safe and secure that only your remote will work on your system. When you’re choosing a remote control for your fireplace, the most important consideration is compatibility. Many newer gas fireplaces are compatible with most remotes. You can change the temperature, the heat level and program the fireplace to go off at a certain time, or turn on a certain time. A remote control for you fireplace means that you don’t have to get up and manually change the controls when you want a different setting on your fireplace. There are many different remote controls available that go with fireplaces. It’s essential to read up on the specifications of the remotes, as well as consumer reviews from others who have used the remote. This type of information can help you find the best remote for the money. It’s also helps you to know that you’re choosing a remote that will work with your fireplace.